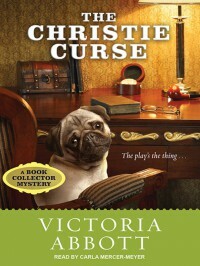 This book sounded cute: a recent college grad gets a job doing research on finding literary collectibles, and her first task is to try to find a previously unknown Christie play. It started off okay, and there's a cute dog, but I got tired of the descriptions of Jordan's vintage clothes, and the writing was just too slow in places. At one point, when relating Jordan's reaction to being startled by someone she thinks is going to attack her, she digresses into discussing all the self defence techniques her uncles taught her, talks about how a headbutt would be most appropriate, talks about taking aim or whatever, and still hasn't actually reacted to her attacker. And that wasn't the only instance. I'm not sure if the author was trying to build suspense or something, but it just didn't work for me. The "twists" at the end were just way too predictable; I'm not very good at calling what's going to happen in a book, so when it happens like this...I have to feel that it's the book's failing. So not a new audio mystery series for me to work my way through, unfortunately.